A great feature of all Apple products is the operating system IOS. IOS has some neat settings that you can utilize to monitor what your children are downloading to their I-devices whether it be an ITouch, iPhone, iPad or iPad mini. on the same iTunes account (which I encourage for email receipts). You can turn on automatic download to all your devices or just certain ones. What the feature is meant for is to keep you from downloading the same app on multiple devices. For example, download the app Dropbox to your IPhone then It automatically downloads to your IPad, iPad mini or any other I device you have. Very convenient to keep you from having to download individually to every device. Even more important it is a great way to know what your kids are downloading when you are not around. Yes I realize this automatically puts candy crush or any other kids game they download onto your device also, but all you have to do is delete it. I like knowing that when my kid is at a slumber party or in her room on her I device that I know what she is downloading immediately instead of having to wait on an emailed receipt. To turn this feature on it only takes a few steps. From your device, follow listed steps. 3. Once you are inside the ITunes & App Store, scroll down under the automatic downloads and slide the ‘apps’ to show green. This turns the auto download of apps feature on. Now any app that is downloaded will be auto downloaded to this device. You can also turn on ‘updates’ which will automatically keep your apps updated with you having to manually do it. 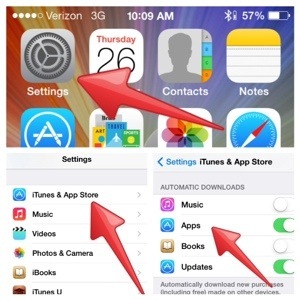 Once you have the auto updating Apps turned on, any app downloaded under your iTunes account, regardless of what device, it will download to your device also. You will be able to monitor and stop your children from downloading dangerous apps, since a lot of times they are just curious from what they have heard from friends or school. They will also think your magic when you know within 30 seconds what they are downloading, and you are no where near.